Langley Arb are very proud to announce that we have been awarded a 3 plus 3 year Network Overhead Lines Tree Cutting Contract with Scottish and Southern Electricity Networks. A lot of time and effort was undertaken by multiple staff over a long period of time during the tender stages to reach this target so we are all extremely proud. 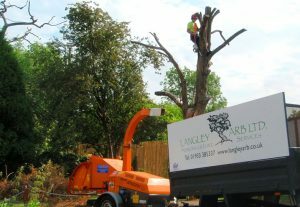 For the second time in succession we have been chosen undertake all aspects of Arboriculture works on a framework agreement with one of the largest and upmost respected Distribution Network Operators in the country. 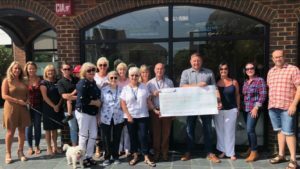 Today we presented a cheque for £6,200 to The Waterside Cancer support Centre from our recent annual Charity Golf Day which took place in July. 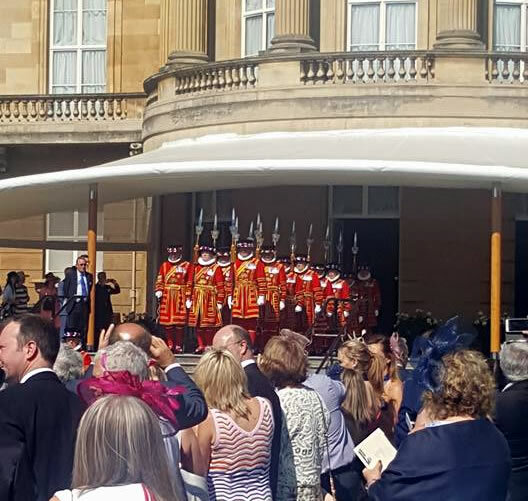 This has raised the total donated to the centre just over £25,000 in the last 6 years. Thank you to all who came to present the cheque which included volunteers from the centre and sponsors. These were Michael Osman, Donna Osman, Lisa Elkins, Ann Macdonald, Justine Harnett, Clodagh O’Connor, Katrina Dearden, Karen Gemmell, Mo Organ, Sue Newman, Sue Burton, Sheila Langley, David Richardson, Judith Turner & Simon Chadwick. A huge thank you to sponsors who continue to support us each year which included us Michael & Donna Osman of Oyster Financial Planning, Warren Burch at Sea Mariner, Martin at The Lovely Little Café, Chris at Christopher Hoare Tree Surgeons, Shaun at Holbury Tool Hire, Mark & Angela at Ebeneezers, Habib at Be Be’s Café, Harry Hunter Window Cleaning, Nick at Langley Arb, Hampshire Window Services, Rob Watkins Builders, Chris & Julie Hall at The Langley Tavern, Brendan & Stu at Home Projects Solutions, Kevin Cull at Brooks Macdonald, Nigel Gemmell @ Dawkins & Lodge, Sean & Theresa at Sherlock Screeding, Dan, Tom & Co at Braodsword Projects, Tony at Anthony James Properties, Ryan & Claire at The Travelers Rest, Waterside Network Group, Benny Carr at ABG,Taddy at Forestside Construction, Dave & Clo Carr & Karien & Sol Reed. Oyster Financial Planning, John Wilde at Victoria Park Glamping, Tom Hawkins at Old Mutual, Amalfi, Steve Hurst, Steve Wosley, Jen Bekker, Lucy Richmond, MY Time Golf, Ben Maguire, Portofinos, Marine Seventeen, Jerry Still, Seashells, Ice Cleaning, Hythe Garage, Jack N Grills, Lorna Moore at Age Repair, Rachael Jones, Sandras Florist, The Herld & Simon Chadwick. Without the generosity each year from everyone we would not be able to achieve what we have, not just for the Cancer Support Centre but for other charities all in our postcode. THANK YOU TO EVERYONE INVOLVED. Two of our managers went to the Arb Show at the National Arboretum, Westonbirt on the 12th May 2017 to find and source new innovative ideas to provide to our customers. We also looked at the new chippers and vehicles on offer to update our fleet. It was a good day and hopefully our customers will benefit with the investment we shall will make.